This page is about the tank destroyer Jagdpanther. For the premium version, see Bfw. Jagdpanther. For other uses, see Panther (Family). The Jagdpanzer V Jagdpanther is a rank IV German tank destroyer with a battle rating of 6.3 (AB/RB) and 6.7 (SB). It was introduced in during the Closed Beta Test for Ground Forces before Update 1.41. Suspension wheels and tracks are 20 mm thick, though the interleaved pattern of the wheels provide cumulative 20 mm protection. Ammo racks of the Jagdpanther. The Jagdpanther is best used defensively, to cover capture points and prevent their capture, and cover friendly tank advances. It's highly recommended to hide the lower frontal plate in this tank, as it has a frontal mounted transmission which will set the tank on fire if shot, as well as destroying the transmission. It's also strongly advised to use this tank at long range, and change position often. It is important to keep in mind that the Jagdpanther's armour is sloped. Using it on the side of a hill facing the enemy is extremely dangerous, since this would decrease the angle at which the frontal armour and sloped and thus negate a large part of its survival capabilities. By hiding behind buildings, trees and bushes, or on top of a hill, you optimise it's fighting capabilities. A well positioned Jagdpanther is very hard to destroy. 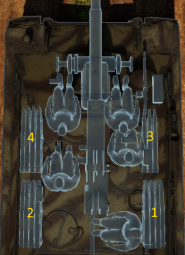 In addition, using the Jagdpanther in a diamond position (with your right side facing the enemy) will mean that your most important crew members are better protected (driver, gunner, commander) since they are on the other side. Nazi Germany created the formidable 8.8 cm Pak 43 anti-tank gun, a longer version of the 8.8 cm Kwk 36. 2 attempts were made to fit this gun onto a self-propelled configuration, the first was Panzerjäger Tiger (P) Ferdinand (later Elefant) and the second was the Nashorn. 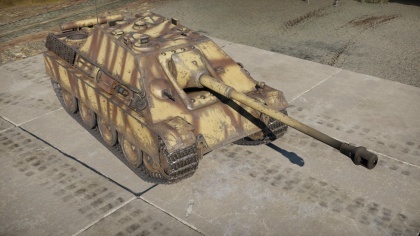 However, the Ferdinand was too heavy and unreliable while the Nashorn was too small and underpowered to propel such a gun. The Jagdpanther was proposed in late 1942, as a tank destroyer from the Panther chassis that could mount the formidable 8.8 cm Pak 43 with good armour and speed. The tank destroyer was created and designated SdKfz 173 and was demonstrated to Hitler on October 1943. Production then started in January 1944 under the simpler name Jagdpanther by Hitler rather than using the longer 8.8 cm Pak 43/3 auf Panzerjäger Panther. Throughout its production life of January 1944 to 1945, 415 total of these vehicles were made. MIAG produced 270 from Januray 1944 to the end of the war, MNH produced 112 from November 1944, and MBA produced 37 from December 1944. The supposed goal was 150 Jagdpanther produced a month, but Germany's deteriorating situation made this impossible. The Jagdpanthers were made in two variants, G1 and G2. The G1 had a small internally bolted main gun and modified Panther Ausf. A engine deckwhile the G2 had a larger simplified, outer bolted mantlet with a modified Panther Ausf. G engine deck. A proposal to mount the 12.8 cm Pak 80 was mentioned, but never came around to production. The Jagdpanther was a rather good design as a tank destroyer, it had a good power-to weight ratio and had a gun that could destroy any allied tank in service in the war. It did not suffer as much reliability problems due to being based of the later model Panther Ausf. G, which had most of the initial problems fixed. It also used an improved transmission and final drive (the two sources of most Panther issues) that was planned for the Panther II. 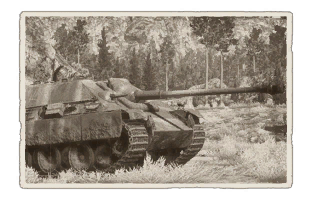 Jagdpanthers were assigned to heavy tank destroyer battalions in the Western Front and Eastern Front, though most of the Jagdpanthers were sent to deal with the Soviet onslaught, where it first saw combat action. In Normandy, few of these vehicles were encountered by the Western Allies, though 12 were deployed in one occasion by the 654 schwere Panzerjäger-Abteilung against British units. One instance in July 30, 1944 saw three Jagdpanthers engage and destroy 10-11 Churchill tanks in about two minutes, though two of them were abandoned by the crew due to damage. The 654th was the only battalion to have a full compliment of Jagdtigers of about 42 Jagdpanthers at the Western Front, the 559th battalion only had 10 to 14 of these vehicles. The largest concentration of the Jagdpanther on the west was during the Ardennes Offensive of about 20 vehicles combat-ready. After the end of World War II with Nazi Germany's fall, the Jagdpanther and its original Panther configuration saw service with France. The Jagdpanthers served France from 1945 to the 1960s. Skin and Camouflages for the Jagdpanther in Warthunder Live. Bfw. Jagdpanther - Premium version of the Jagdpanther.